Bill Minutaglio and Steven L. Davis’ book, Dallas 1963 has just been published to coincide with the 50th anniversary of Kennedy’s assassination. It offers a unique perspective, examining the political and cultural climate of Dallas in the years leading up to the tragic assassination of President Kennedy. They attempt to answer the question, why Dallas? I heard an interview with Minutagio on NPR during which he highlighted several interesting and little known facts about these turbulent times, including the Mink Coat Mob Riot. Turns out that the Mink Coat Mob Riot happened in the days leading up to the contentious 1960 Presidential election. It was an important moment in a long series of events, symbolic of the deep-seated anger and hysteria that the President would encounter three years later. In 1960, though, Lyndon Johnson was desperate to win his home state of Texas and was taken aback by the venomous reception he received while on November trip to Dallas. …So frantic did LBJ become at one point during the campaign that Jack Kennedy told him, “I believe you’re cracking up.” Among other things, LBJ was sick with worry over the prospect of losing Texas. “I need you as I have never needed you before,” he cabled wealthy Fort Worth publisher Amon Carter. 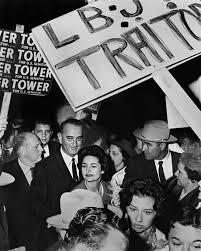 In a last-minute effort to generate support, LBJ decided to travel into that heartland of radical conservatism, Dallas. Aides in Texas scheduled a luncheon address at the Adolphis Hotel on November 4. Lyndon and Lady Bird flew into Fort Worth that morning and were picked up by Carl Phinney, a retired military officer and Democratic activist. Approaching the outskirts of Dallas, the Johnson party was stopped by city police and told there was a ‘disturbance’ at the Baker Hotel, where Lyndon and Lady Bird were booked. The officer in charge insisted on taking the Johnsons in through the back entrance of the hotel. There was no avoiding the lobby, however, and what Lyndon and Lady Bird found there was a throng of well-heeled Republicans led by the reactionary congressman from Dallas, Bruce Alger, and Lyndon’s opponent in the Senate race, John Tower. 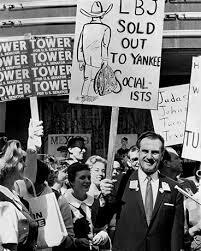 The crowd, bearing banners reading, “LBJ Sold Out to Yankee Socialists” and “Beat Judas,” booed and hissed when they saw the vice-presidential candidate. They party shouldered its way to the elevators.